In the past, I have provided talks to visitors to the town and have included a section on the village of Felpham. Of course, the irony is that it was recorded and mentioned long before Bognor was established. Some people just drive along the A259, through the village, on their way out of the area and do not actually visit. Therefore, I thought I would take a look at the village. To be a village there should be a pub, a church, small shops, history and ‘picturesque cottages’. So far, so good as Felpham has all of these. One of the first problems, however, is how do you pronounce the name of the village, is it ‘Fel-p-ham or Fel– f –am.’ I am, of course, aware there is as much discussion today on this subject as there has been for many years. According to the publication ‘Place names of Sussex’, there were many mentions of the place, which appeared to mean ‘fallow-enclosure’. One report in 1575 showed a spelling with ‘P,’ however, and it is shown as ‘Phelpham.’ I am sure that these discussions will continue well into the future. It appears that in the Domesday Book it is shown as ‘Felcheham’ and was described as a ‘pleasant village and parish in the Western division of the county’. According to the 1882 Sussex Directory, it shows that Flansham and Ankton (or Ancton) are hamlets belonging to Felpham. In 1882, the commercial part of the village records a grocer, shoemaker and post office, gardener, farmers, blacksmith, shopkeeper, miller, butcher as well as the various licensed premises – Fox, George, and Brewer’s Arms. Census returns also provide an interesting view when in 1851 the population of the village was 479, with 92 occupied homes and just one unoccupied building. By the 1990s, the population had risen to approximately 9,000. 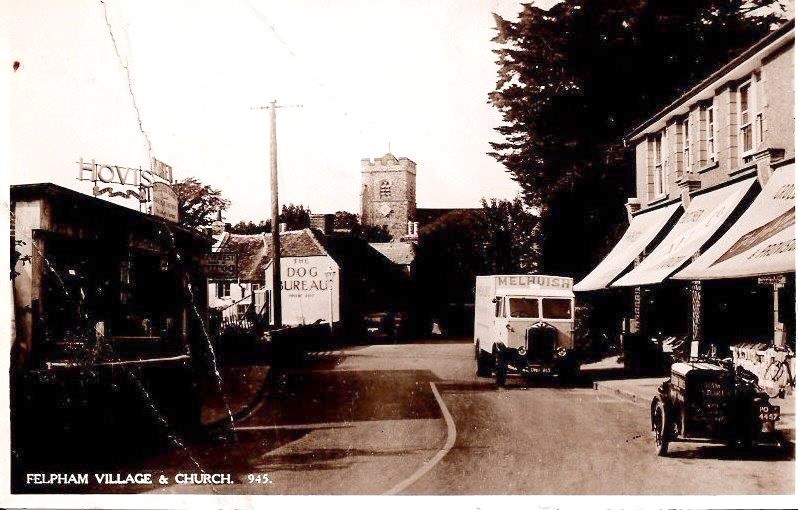 The church is still the heart of the village and has been depicted on numerous postcards sent home by happy holidaymakers, including one person in 1907 who wrote on the reverse of her view of the church, ‘this is where Rev Talbot is now’, and was sent to Haywards Heath. In the Domesday Survey of 1086, a church was mentioned within the village, but this possible wooden construction has long since been lost in time to be replaced by today’s building. Felpham church commenced around 1100 and has had many extensions and additions throughout the years. Today, it is a busy centre of the village and a full written history of the church is available there. There is an incredible amount of history in the village, but people also make it notable. The most infamous resident was William Blake, who arrived in 1800 when he was commissioned by William Hayley to decorate his library. A famous case saw William Blake put on trial for sedition which took place at Chichester in 1803. Upon his acquittal, Blake moved back to London. Pictures of his cottage – Rose Cottage – in Felpham are shown on websites and in books to add to the interest visitors have shown in the village. Cottages, while not quite so evident today after years of new buildings, can still be found, but perhaps they would not quite evoke the message sent to Beckenham on a postcard in 1912 which said, ‘this would suit you A1 down here there are such a lot of old thatch cots with grass growing on the roofs’. If you take the time to look, there are many cottages remaining, with names and appearances that continue to reinforce our perspective of a village environment. Some of the cottages had such idyllic names as Pear Tree, Lavenham Cottage, and Vine Cottage. Many of these cottages are also listed buildings. In 1929, there was a report in the local paper which talked about a ‘year of progress’. It remarks that Felpham was moving from a ‘sleepy hollow’ to an increasingly up-to-date seaside suburb. Another remark in this article would seem to remain true today, whereby ‘several local organisations were forging ahead —- and that the ratepayers are starting to take an intelligent interest in matters that vitally concern them’. Village alehouses have changed considerably over the years, both in the range of items they sell and their clientele, but they still serve visitors and residents alike. The George started out as an alehouse known as the St George & Dragon in 1705, however, this disappeared and eventually The George came into existence around 1832. The Fox, with its unusual inn sign, has a very long history, dating back to the 1790s. The Thatched House dates from 1842. The Brewers Arms was demolished in 1924, to be replaced by the Southdown Hotel. Eventually, the Barn in Felpham opened in 1972 and this was originally an old flint building that had been converted into a private residence in 1920. There was once an alehouse, named ‘The Hero of the Nile’, which was situated on the site of the present post office. Visitors have come to the area for a variety of reasons, not least the children who arrived to stay at the Sunshine Home situated in the buildings opposite today’s Felpham Bazaar. One child in 1912 wrote on their card sent to Surrey that they had ‘counted 14 windmills on their train journey’, such excitement and to stay near the sea as well! As I mentioned earlier, many things make up a village, and it would appear that Felpham still retains many of these facets of village life. The people who are involved in many of the groups and councils are still all working towards generating the ‘feel of a village’. Many of the visitors in the last century recorded on their cards that they would ‘take a walk into Bognor’ or ‘we are going out for the day to Bognor.’ Visitors still arrive both to see the sea but also to enjoy the village atmosphere of an area mentioned in the Domesday Book, sitting next to the more famous Bognor Regis. Long may it continue.